Worst touchless car wash ever, and one of the most expensive too. The car came out visibly still dirty. I am not comparing this touchless wash to a spinning wash, I am comparing to other touchless washes that I have used which perform much better. The water jets seem to spray hard enough, so it must just be really cheap/diluted soap. Please try switching soaps as I feel this is the root of your bad reviews. The touchless wash at the Chevron at No 5 Rd and Steveston Hwy did a great job, but the recently switched to a spinning cloth wash so thats no longer an option. The Husky at Garden City and Bridgeport Rd does a good job so thats really the only place in Richmond left to get a good touchless wash. 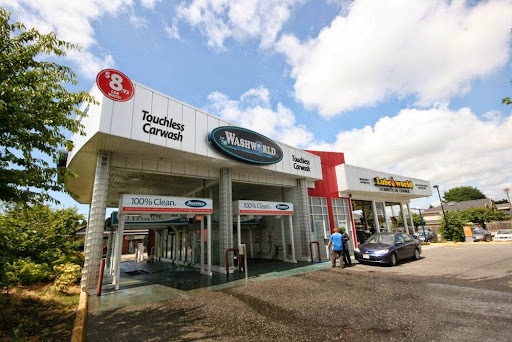 I would recommend everyone go there until Washworld realizes that their particular touchless wash is the problem, not touchless washes in general, and takes steps to fix it. Very expensive for a mediocre wash. For half the price of their premium touchless or soft touch wash, I can get a cleaner wash from the touchless Husky on Marine Drive. I work very close by and often pass this place and the soft touch side is also often under repair. One time the soft touch broke during the wash infront of me but I had already paid... So the attendant wrote something on my receipt and said I can come back after they fix it. I showed up about 3 weeks later, only days after it had been fixed, and the same attendant proceeded to ask me for a code because I was apparently supposed to call head office for one? Well he didnt tell me about that. And he wasnt able to figure it out either so he manually scrubbed my car with a bucket of soap and put me through the touchless. Spent $21 on the "best" option. Car came out with spots of dirt still on it. I am not one to complain usually and since it had been a year since I had washed my car I figured that it was clean enough. Drove away and noticed a clunking noise coming from under my car. Pulled over and noticed a plate underneath was loose. Wasnt able to return to talk about this issue until later that evening when I there were no employees on site. Upon reading the reviews of other peoples bad experience with this place it seems like it would be pointless anyways. Took my car to Canadian Tire where they told me a bolt had been knocked off the heat shield. Huge inconvenience since the part I need to fix it is only available through the dealership. Not impressed. Will not be returning. They have recently replaced one of their lanes to a newer cloth wash machine which I have not used although the staff promotes it over the older touchless machine. I have had good experiences with the touchless one and will likely continue to use it as long as it is still there. No residues or other issues like others are saying around here. Automatic car washes are always just a stop gap solution until you can properly wash and wax the car yourself or get it detailed at a shop so dont risk a cloth wash for something that wont keep your car clean for long anyway. My car looked the worse after the car wash, instead of cleaning my car, it came out to be a sad looking thing. After the wash it left so much soap residue on my car, it looks like a halloween themed car because of all the gross looking drips. Secondly, the wind shield wasnt even cleaned at all. Unfortunately, I only saw the rest of the spots during the day, because I washed the car in the night. Terrible place to get a car wash, I would rather spend $3 less at Petro Canada, and get a better job done. We paid for the "best" automatic wash ($24 tax in) but the machine failed to start; after we paid and drove through the green lights and to the stop position, literally nothing happened. For five minutes we just sat there, until finally the machines dryer fans kicked in, telling us that our "wash" had completed (except we didnt get a wash at all). Steveston and 4 Road location - we have called and left a message and will be following up in the morning. Worst. Car wash. Ever. Worst car wash experience ever. I selected to get the "best" option available for a car wash. Didnt really clean my car. My car was left with streaks of purple that cannot be removed by washing it with water. I went back to ask if this could be addressed but the attendant was not helpful at all. Dont come here unless you want to leave with your car dirtier than before. For $20 the car better be spotless. I wont go back for that price. The Chevron is cheaper and does a better job. I gave two stars only because the guy who washes your tires was nice. Paid for the second choice which includes washing the cars underside. The experience was fun and colorful but the washing was not really clean as there are missed spots on the car. $17 wash will you get you any clean. The worst automatic carwash experience ever. Dont waste your time and money. Back of my car still have lots of bubbles when it came out. Absolute terrible, car is NOT CLEAN and still cover in lots of dirt and bird dropping (only a couple days old). DO NOT waste your money! for $20 go somewhere else! The parts of the SUV that were cleaned during the wash, now sparkle-- but a half dozen places were missed. We expected more for a $24 automated wash.
Touchless car wash. OK to get the first layer of dirt off. Doesnt do a good job on the lower door panels or the back of a hatchback. Kids love it when I cheat and wash my van here, but wow pricey, yet worth the once in a while indulgence. A waste of money. Doesnt clean the car even with premium package. Better off washing yourself. 21 bucks and my jeep looks like it just got off the trail. Worst car wash you can get with your money..!!! Expensive and doesnt even get the car clean.